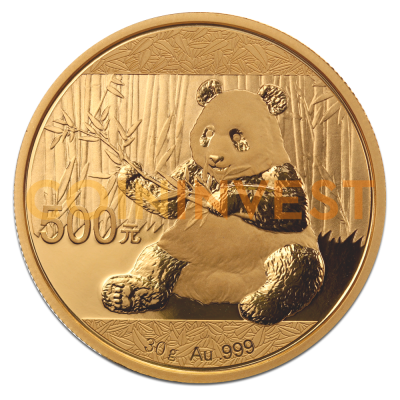 The 30 g China Panda Gold 2017 is an excellent choice for investors who want to add fine gold to their portfolio or for collectors who are attracted by the unique features of one of the world's most popular bullion coins. The China Panda series of gold coins was launched by the People's Republic of China in 1982. The coins were originally issued in troy ounces but changed to the metric system in 2016. The 2017 gold China Panda 30 g coin takes the place of the 1 oz coin. It's made from .9999 fine gold and is one of the purest bullion coins on the market today. The Obverse always features the Temple of Heaven in Beijing while the reverse features the giant panda, a symbol of the People's Republic of China. The panda motif was changed annually until, in 2002, the coin was issued with the same image as the previous year. Collectors objected to the design freeze and the China Panda has featured a new design each year since. Why choose the 30 g China Panda 2017? The annually changing panda design considerably enhances the appeal of these striking coins and collectors eagerly await each new edition. The 2017 30 g China Panda gold coin shows a seated panda with a sprig of bamboo against a bamboo forest background. The 30 g gold Panda is considered a very safe option for investors and the coin's purity ensures that it will always retain its value despite economic fluctuation or strife. coininvest.com recommends the 30g China Panda as a sound investment and as a beautiful addition to your collection. They are available individually or in blister packs of 10 and boxes of 450.